Hello friends, and Happy Friday eve. It feels like this week dragged by, I guess with the Thanksgiving holiday it spoiled me for not having to work 5 days which was a great mini-vacation. Oh well, I am getting back into the swing of things because December is going to be a very busy month. Last Thursday I, like many others were thankful for the opportunity to spend time with my family and especially for having our son home from college. This Thursday, I am thankful that he is back in school studying hard for finals (yea, I said it…don’t laugh) and for also having an opportunity to be the Social Media Manager for B.O.S.S., which I will tell you more about next week. 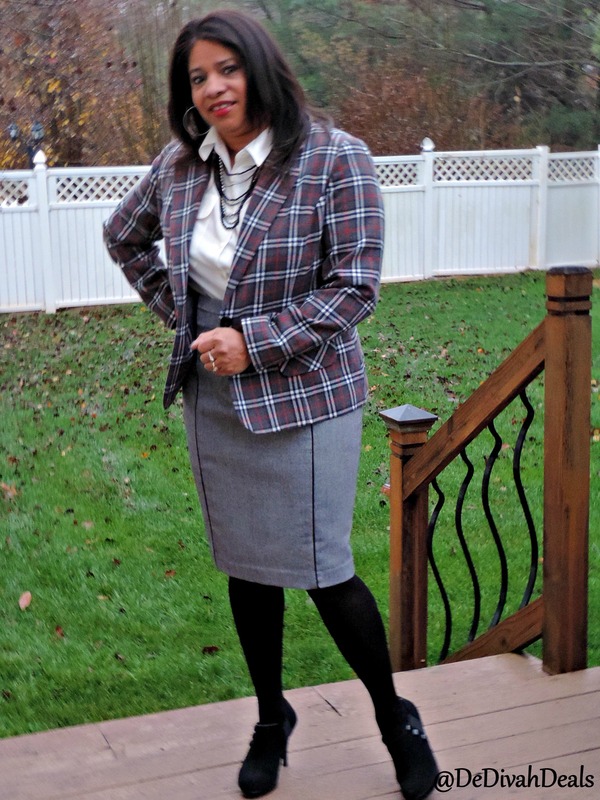 Today, I am also thankful for being invited by FashionPlateKc, to participate in a special holiday fashion series, and this week the first post is entitled Mad for Holiday Plaid. Plaid is a classic pattern, but most times you think of it being worn only by girls in school uniforms. I have several plaid blazers in my closet but they are black and grey and I wanted something more festive. I kinda lucked out when I found this green plaid blazer at Goodwill last week. Even after removing the shoulder pads and pushing up the sleeves it was still too snug so I’ll have to re-donate it. The sleeveless turtleneck and skirt as well as the Nine West purse were also thrifted. The beads were a great find from a Flea Market Vendor and the brown colorblock shoes are from Rugged Wearhouse. Fortunately, I also found another plaid blazer and if you didn’t know, Goodwill is the best place to find a large assortment of blazers, most have shoulder pads, but hey, you can always cut them out. 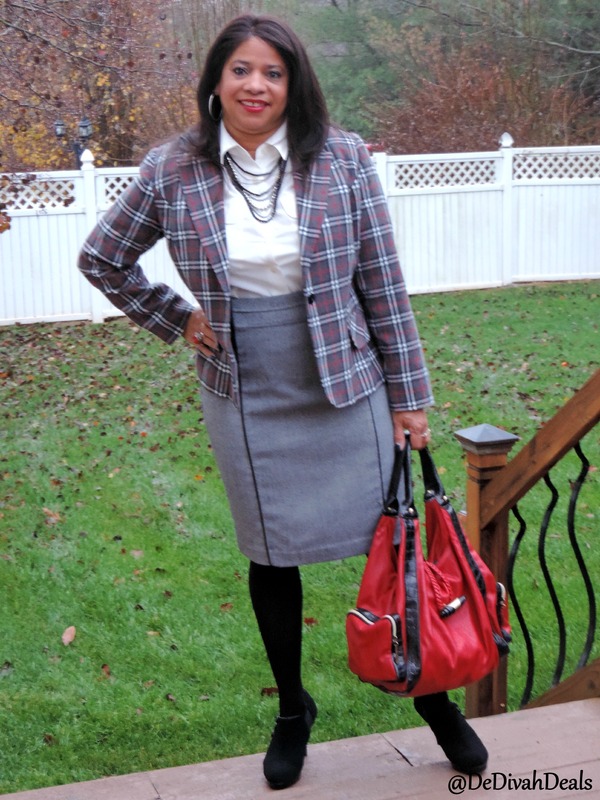 I am calling this outfit Plaid and Pearls which I paired with fur trimmed grey booties and purse. All I needed was a fur hat and I would have been ready for old man winter! 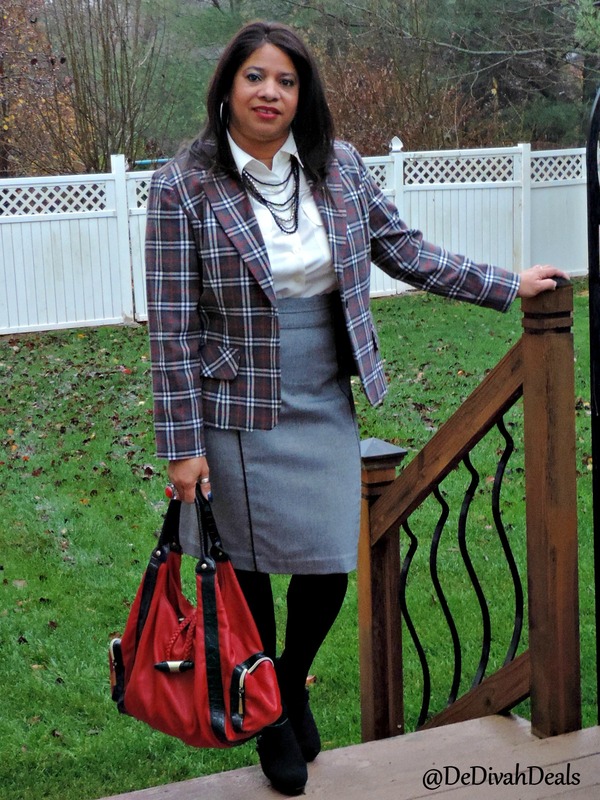 The last outfit is with a plaid blazer which I bought well over 20 years ago but I still love it. The blouse is thrifted and the pencil skirt is from JC. Penney. Time for the tights and booties because Jack Frost has been getting nippy! At least one item must be thrifted. At least one item must be plaid. You must display your personal thrift style. You are too fly, sis. I love all the looks, especially the 2nd one. Really cute! And i’m with you; I feel like the week is going by so s l o w. YAY for Friday (tomorrow), lol! Thank you sis, congratulations again on your little sister’s win – I know you are so proud! I love your mix of plaids and neutrals. on trend and yet classic at the same time. I love it! You look FAB! Thank you sis, I hope you enjoyed your holiday. That last outfit is my fave. All great looks! I especially like the striped dress with the grey booties! So cute! Thank you, I wish I could find a style similar in black or brown. Have a wonderful weekend. Love your outfits, they look great and plaid is so trendy this season. I really love the grey boots. I need some! Hope you’re having a fabulous day. Thank you my dear, I love those little booties too. Enjoy the weekend. Happy Friday eve indeed! You are rocking the plaid. I need to go shopping as I do not have enough plaid in my closet. Raquel, thank you, like houndstooth, plaid is a definite closet classic. I hope you find something this weekend – have fun! Great plaid mix on these outfits and you wear them very well. 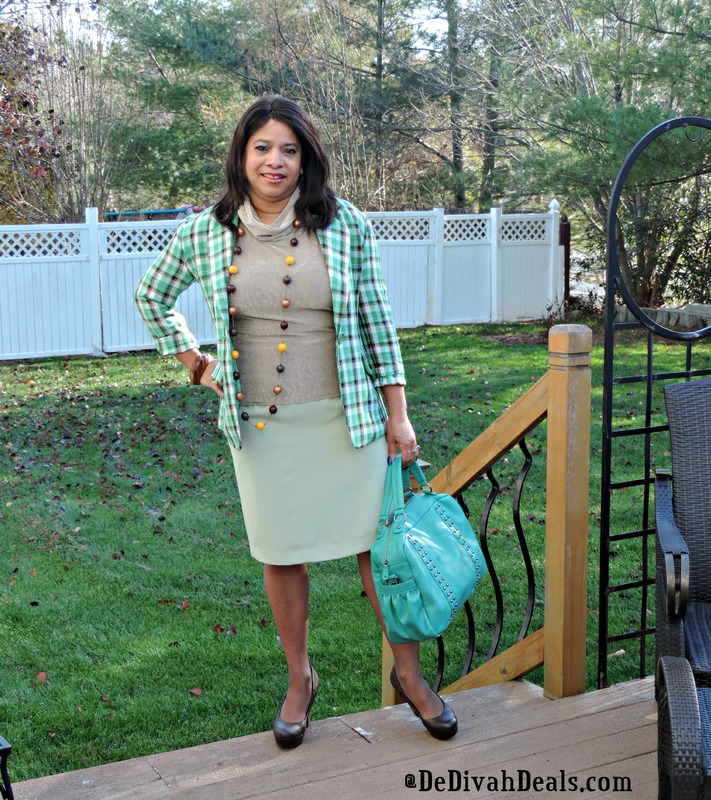 I love the teal/green blazer on you and I am sure you will replace it with one just as fabulous. Thanks Blog Sistah, will be doing more thrifting on Sunday so I hope to find a replacement. Have a wonderful weekend! Yes, plaid is back….thank goodness! I just bought a red and black plaid vest and have been wearing it all the time! The fur cuff boots….girl they are spectacular. Thank you my dear, I know you too are looking sharp in that vest paired with a cowboy hat! Have a wonderful weekend.